G-Shock Classic Watch featuring Shock resistance, 200M WR, countdown timer, 1/100 sec. stopwatch and auto-calendar. 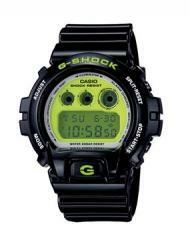 Black resin band digital watch with green face.